You can expect an optical deluge at any city art fair. Ann Arbor, Michigan, combines four fairs into one mid-July 1,200-artist ‘palooza, so you really have to pace yourself. Doing so, I had energy to find love at first sight three times at the Ann Arbor Street Art Fair, at the far end of my route. Billed “The Original,” the 50-year-old event is also the first juried outdoor art event. First crush: the meticulous, sensitive portraits of animals in the wild and amusing hand-tinted illustrations that seemed plucked from vintage books. Brief titles such as “Battle of the Naked Bunnies” trigger musings about possible plot lines. Ann Arbor native David Bigelow studied printmaking and drawing nearby at the University of Michigan. Now living in Ozark, Missouri, he captures the overlooked details of life and lives, and especially in his drawings turns humor into a tool. Animals, vegetables (carrots abound), and minerals convey thoughts on human foibles. David cares that people get his ideas and often solicits onlookers’ reactions. He got mine, and in return I learned how he re-purposed “the worst paper” by “working with what was there instead of trying to impose my will.” He tore the edges and used the large surfaces to draw achingly detailed large beings, such as this elephant [show pictures]. 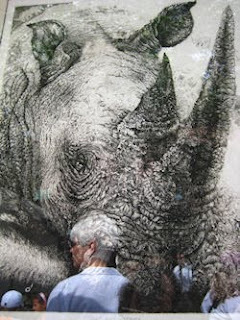 While taking a photo of his rhino etching, I adopted David’s ethos and tried to make the reflections of fair passersby work. See what you think. “They are good for your eyes,” smiles Bigelow about his work. A good reason to visit dbigelowstudio.com. Next, I walked back to the 17th century. With his breath-stopping etchings, Grant Silverstein could have passed as a contemporary of Rembrandt. 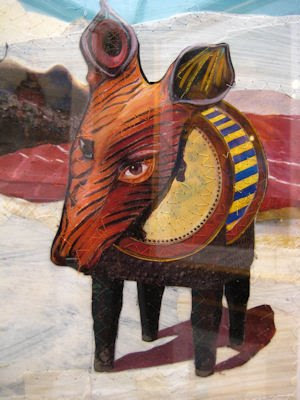 For 30 years, the Mansfield, Pa.-based artist has sought to preserve “a way of looking at things that is still valuable.” He tells the La Fontaine fable behind “The ears of a hare”: after a lion banned horned animals from his kingdom, a rabbit concludes from a shadow that his ears could get him into deep trouble. “Another Difficult Kiss” started as a tiny study of two figures. Silverstein then made it the center of a large-scale village scene complete with fiddler cycling in a wheeled hammock, an element inspired by a contraption spotted during his own travels. 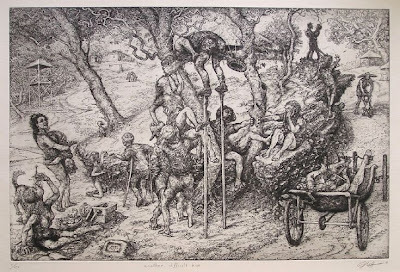 Savor Silverstein’s etched allegories, nudes and landscapes at GrantSilverstein.com. There’s a hint of Marc Chagall, but the content, spirit and subterfuge are pure Madzo. If you visit Ann Arbor before the 2010 Art Fair, check out the University of Michigan Museum of Art. Reopened March 28 after completion of a new wing, it features an impressive collection, including a warrior sculpted from detonated AK-47s. Catch “Warhol Snapshots” between Aug. 23 and Nov. 1. This review by Kevin Mellema has really intrigued me and because of it I dropped by Alexandria's Target Gallery (inside the Torpedo Factory, first floor) last weekend to see the show. To say that I was blown away, as impressed by a gallery group show as I have been in many years, does not even begin to cover how good this show is. It is juried by my good friend Andrea Pollan and I know that Andrea must have been as impressed as I was by the really high quality and intriguing, innovative work by the national and international artists that she selected. These are nearly all "new" artists in the sense that most of them are not from around the region, and their work is a breath of fresh air on a rather mundane subject/focus for the show. More on the show itself, from my point of view later, but if you can, get yourself to Target and see this show. And for my fellow dealers: take the time to go see this show, there are 3-4 diamonds in there ready for prime time. This show reaffirms what I have been thinking for a long time: Target Gallery is easily the leading edge gallery in Alexandria, and I dare say in the region, and sort of the seed for what the Factory itself needs to do (in part) to re-invent/re-vitalize itself. Read the Mellema review here; mine will be up soonest.